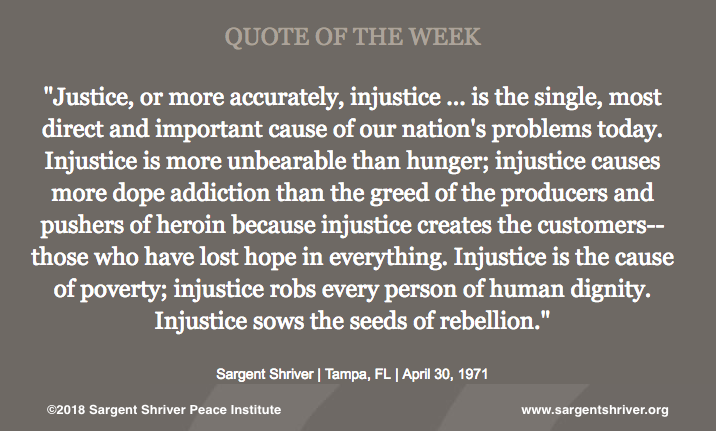 Our Quote of the Week brings into focus the root cause of our most critical challenges -- lack of justice. These words come from Sargent Shriver's 1971 Address to the Tampa Bar Association. Like many of his speeches to his peers, this speech emphasizes that using the law as a tool, we have the power to create a society that protects the human rights and dignity of people. An attorney by profession, Sargent Shriver looked at social issues using the lens of justice. From his quest to desegregate schools in Chicago in the 1950s, to the creation of the Peace Corps and the War on Poverty programs in the 1960s (including his strong advocacy of poverty law), and even in his work as a private citizen, Sargent Shriver consistently adhered to a fundamental principle: that without justice for all, there can be no peace. We invite you to reflect on how our Quote of the Week serves as the backdrop for many of our headlines today. Our treatment of immigrants and others seeking asylum from violence and hunger, our efforts to eradicate poverty, our management of opioids and other addictions, our response to those protesting discrimination: the actions we take to deal with all of these will be determined by our sense of justice.